We know because they have been caring for our pets and their special needs for the past 19 years! Ice cubes in the 50 gallon fish tank due to an extremely hot day. Check. Telling the birthday party of 25 five year olds next door that , "No, he's not a horse and you can't ride him!" Check. Giving medication to several sick cats. Check. Looking for, and finally finding and playing with our indoor scardey- cat. Check. Detailed notes of all things observed during visits. Check. Coming twice in one day due to over anxious parents:). Check. They can handle it ALL with ease and humor. We feel quite fortunate we have our "Ace in the Hole" Ashmont Farm Pet Waggin! I had used many pet sitters in the past, but ever since I was fortunate enough to find Kim, I would never change! I have been with Kim for nearly 20 years and have found her to be reliable, honest, and extremely intelligent. Kim always goes above and beyond. Since she is also a veterinary technician, she has been able to take care of a sick cat, from time to time. She has provided fluids, insulin injections, pills and anything that they needed. All of my cats love Kim and so do I. I feel so comfortable leaving her with my cats AND with my home. Prior to taking me on as her customer, she interviewed me quite thoroughly. She did this, so she can take care of any emergency that may arise during my absence. Without her, I would never feel comfortable going away. When I found Kim, it was my lucky day! I have had the privilege of benefitting for almost 20 years from the services Kim & Peter offer through Ashmont Farm Pet Waggin. I could not imagine giving over my dogs care to anyone more professional, knowledgeable or trustworthy than Kim or Peter. They provide consistently wonderful services and I know that when my dogs are under their watchful eye, the dogs are safe and are being handled by the best in the business. I highly recommend using Ashmont Farm Pet Waggin dog walking services !! Kim is flexible and patient about schedule changes - my work sometimes keeps me late, or allows me to go in late, and Kim has always been able to arrange walks to match. Or - when possible Kim brings our dog to play with others, a great opportunity to run around. I always feel slightly less guilty knowing he is joining Kims groups during his long day alone. 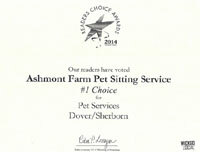 For the past 16 years Ashmont Farm has provided outstanding care for our dogs and cats. With Kim's knowledge, dedication, thoroughness, dependability, and humor, she has given our animals and us the very best of care."